As far as time spent outdoors is concerned, most of us would prefer to proverbially “soak up the sun” without the sunspots to show for it. For this reason, sunscreen is arguably one of the most important product in anyone’s skincare regimen. After all, it protects skin from the sun’s harmful UV rays, which can accelerate aging and increase cancer risk. Despite its importance, choosing a sunscreen isn’t as simple as snagging, say, the perfect red lipstick shade for your skin tone (although that can take a minute, too!). There are two distinct categories of sunscreen “technology”: physical sunscreen and chemical sunscreen. Let us shine some (UV-free) light on both so you know what you’re shopping for. Physical sunscreens (often called “mineral sunscreens”) reflect the UV light away from the skin by creating a protective barrier, explains Dr. Joshua Zeichner, Director of Cosmetic and Clinical Research at Mount Sinai Hospital's Department of Dermatology. This barrier is typically made from zinc oxide or titanium dioxide. Generally, physical sunscreen formulas have a thick consistency and may take a while to completely rub in. One advantage of a physical formula is that it provides immediate protection. Dr. Mona Gohara, Associate Clinical Professor at Yale Department of Dermatology and a medical content reviewer for the Skin Cancer Foundation, usually recommends a physical sunscreen containing iron oxide. “Not only does it offer protection against ultraviolet light,” she says, “but [it offers protection against] visible light too.” According to studies, visible light — i.e. light from light bulbs — can worsen melasma. Chemical sunscreens absorb the sun’s rays and convert them into non-harmful heat energy, explains Dr. Zeichner. These formulas can be made with a myriad of chemicals, including (but not limited to) avobenzone and octinoxate. Chemical sunscreen formulas are generally thinner and absorbed more quickly than their physical counterparts, though it’s important to note that they take around 30 minutes to work (so protection is not immediate). However, there are a few factors you might want to consider. If you have sensitive skin, you might want to use physical sunscreen: “Those with rosacea, acne or eczema may want to avoid chemical blockers,” Dr. Gohara explains, “as the chemicals can irritate already inflamed skin.” Soothing sunscreens like EltaMD UV Clear Broad-Spectrum SPF 46 ($32) provide non-irritating broad spectrum protection for even the most sensitive skin. If you have a deeper complexion, Dr. Zeichner generally recommends a chemical sunscreen. “Sometimes, mineral [physical] blockers leave behind a whitish discoloration,” he notes, “chemical blockers are better absorbed into the skin.” That said, some newer mineral formulas such as the Murad City Skin Age Defense Broad Spectrum SPF 50 ($65) work well on most skin tones. Lastly, if you spend a lot of time sweating outside, chemical sunscreens are probably the way to go. Dr. Zeichner notes, “most sport sunscreens tend to use chemical blockers because they may run less than mineral blockers.” In other words, chemical sunscreen is less likely to sweat off and leave you unprotected. 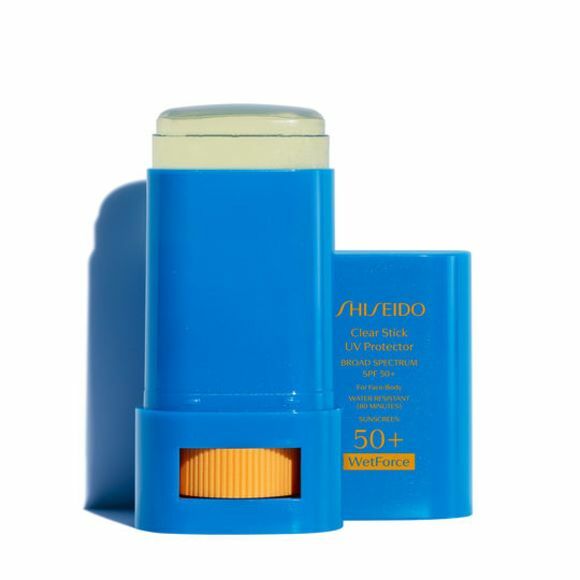 We love Shiseido Clear Stick UV Protector WetForce SPF 50+ ($28), which not only goes on clear and is water resistant, but it’s also portable and mess-free. Whether you opt for a physical or a chemical SPF, the most crucial thing to look for, Dr. Gohara says, is “broad spectrum with SPF 30 or higher.” The “broad spectrum” labeling ensures you’re protected from both UVA and UVB rays. Gohara also notes it’s important to reapply any sunscreen every two hours. If that seems like a lot, take the doc’s advice and choose a “cosmetically elegant formulation,” such as a mineral SPF powder, which can easily be brushed over your face without disturbing the surrounding makeup. One popular option is Mineral Fusion Mineral SPF 30 Brush-On Sun Defense ($25). Go forth and protect!